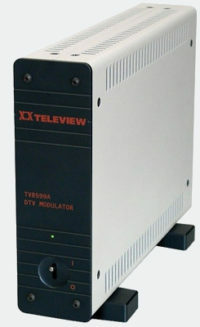 AZ110 - Broadcast Satellite Modulator | AdvancedDigital Inc. The AZ110, manufactured by Newtec, is a state-of-the-art satellite modulator designed for broadcast contribution, DSNG and distribution applications over satellite in full compliance with the DVB-S/S2/DSNG standards. In its default configuration, the AZ110 is capable of transmitting one MPEG transport stream in DVB-S, DVB-DSNG or DVB-S2 mode. The AZ110 allows automatic or manual selection between two ASI inputs and has dual ASI monitoring outputs. Optionally, an optical ASI interface can be added. BISS scrambling options can be activated to scramble a single stream or Multiple program streams (BISSM). The ability to interface (via a GbE input) with equipment or networks that carry transport streams over IP with the RTP or UDP protocols. The IP layer is removed by the modulator before transmission. The ability to transmit IP services (file transfers, VoIP, TCP services…) and transport stream(s) simultaneously. In this case the modulator performs the encapsulation of the IP data in XPE mode. The ability to transmit IP services or transport stream(s) alternatively. In this case the modulator performs the encapsulation of the IP data in XPE or MPE mode. When several transport streams and/or IP services are transmitted simultaneously, the Variable Coding and Modulation (VCM) option allows each QoS or stream to be modulated with its own parameters. At the output of the modulator, the signal is available on an L-band interface. IF- and RF-band as well as BUC power supply and reference frequency are available as configuration options, providing a compact and cost effective solution. This modulator provides exceptional performance and bandwidth efficiency. When activated, the unique linear and non- linear predistortion option Equalink™ provides an additional link margin improvement of up to 2,5dB, truly unleashing the full efficiency of higher modulation schemes such as 16 and 32 APSK. AZ110 – default configuration: DVB-S (QPSK, 8PSK, 16QAM), 5Mbaud, ASI input, L-Band output. For various options (input, output, modulation, symbol rates, etc) please see the “Ordering Information” section in the datasheet.